Salt water sprays across the bow as the captain steers into the wind. Bracing herself against a guardrail, Cristina Castro, a researcher with the Pacific Whale Foundation, points toward the horizon, where the gray-blue sea meets the gloomy skies above. At first, there is nothing. But then a smooth, black form breaches the choppy water like a surfacing submarine: a humpback whale. A stubby dorsal fin, then the body grows narrow. One final flap of the tail, and the magnificent creature is gone. Another soon takes its place. It appears there are three whales, swimming alongside what must be 40 dolphins. Castro makes a run for her camera—such mixed pods are a rare treat, even here at a prime whale-watching locale near Puerto López, Ecuador. Ecuador, as it turns out, is less a hunk of land than a stretch of open ocean: The country’s maritime territory is five times larger than its continental one. And, in addition to being home to humpbacks and dolphins, these coastal waters host one of the world’s largest aggregations of giant manta rays. Then, of course, there are the whale sharks, the largest fish on the planet. All of which explains why it is so troubling to see, later that day, a lone humpback surface, tangled in a tattered yellow fishing net. Seemingly exhausted, it rests motionless on the surface. Every time the boat comes close, the whale dives, dragging with it a long strand of fishing floats. Although this area is a marine reserve, the whale could have run into the abandoned “ghost gear” floating just about anywhere. The captain notifies park authorities, who deal with such entanglements more often than one would hope, and two days later they are able to save the whale. The episode is a reminder that whales aren’t the only ones plying these waters, and protecting an ocean ecosystem is a daunting task. “We are a fishing nation,” says Pablo Guerrero, fisheries director for WWF-Ecuador, Latin America, and the Caribbean. Along with controlling one-tenth of the world’s canned tuna market, Ecuador also has some 30,000 to 46,000 small fishing vessels, believed to be the largest artisanal fishing fleet in South America. This diversity creates a chaotic fishing environment fraught with conflicts. Steve Junak sits in the back seat of the Toyota 4Runner, his eyes trained on the green-gold blur of central California vegetation like a gambler glued to a slot machine. What’s just grass to most people are sedges and rushes and ryes to Junak. Those sedges might be round fruit sedge or split awn sedge. Some of them he can distinguish from a distance. Others he might have to hold in his hand and squint at. “Sure is,” says Riege, as the vehicle pulls off to the side of the dirt road, high up on a ridge overlooking the Pacific. Junak takes a full census of the botanical jackpot they’ve discovered on this June morning: morning glories to the left, coffeeberries to the right and monkey flowers straight ahead. Riege and Junak record the GPS coordinates of native plants that will provide seed stock for some upcoming coastal prairie and oak woodland restoration projects on this 24,364-acre preserve, which TNC acquired in December 2017. The purchase was made possible by a $165 million gift—the largest single philanthropic gift in TNC's history—from Jack and Laura Dangermond. It marked the first step toward safeguarding this iconic property at Point Conception, Southern California’s “elbow” where the coast bends northward to San Francisco. The Conservancy had tried, and failed, to purchase the property in the past. 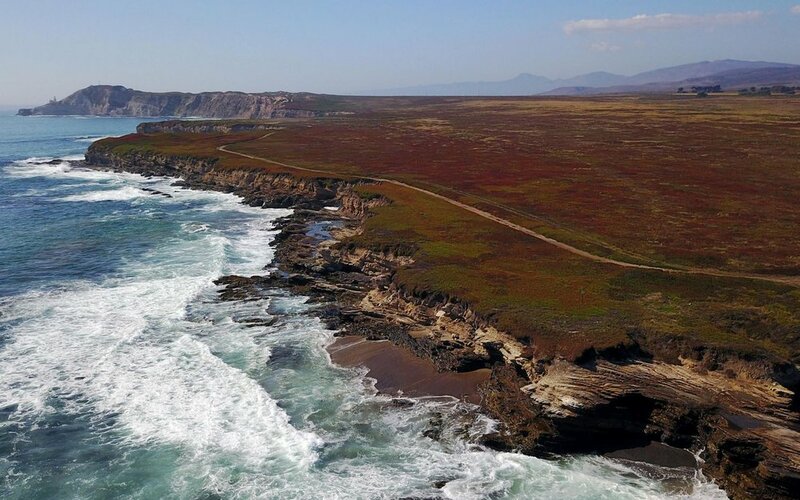 It was one of the last large, privately owned and still-undeveloped coastal tracts in Southern California, making it a rarity amid one of the country’s most expensive real estate markets. Cedars Ernest was a certifiable goofball. He was a purebred Shire, a type of British draft horse that once specialized in hauling carts of ale. Nicknamed Ernie, he tipped the scales at more than a ton, and had a chocolate-brown coat with luxuriant white hair feathering his hooves. His owner, Nicole Carloss, a horse trainer in Queensland, Australia, adopted him in 2013, when he was 7 years old, and he immediately found his place in her family. “He would burst open the screen door and try to do the dishes with you,” Carloss said. When her children played in their sandbox, Ernie would plop his front hooves down next to them. Carloss took Ernie to compete in shows throughout the state, where he would strut around with a sequined browband. “He stole everybody’s heart,” she said. In August 2016, Carloss came home from work and headed out to the fenced pasture to visit Ernie. He lifted his head dolefully, like Eeyore from Winnie-the-Pooh. His eyes were empty, his breathing was strange, and he wobbled when he walked. Carloss suspected he might have been bitten by a snake, but she saw no fang marks on his legs. She called a local veterinarian and described Ernie’s symptoms. The vet asked Carloss if her horse had been vaccinated for Hendra. Carloss had anticipated the question, but that didn’t make it any less unsettling. Hendra is a deadly virus that is endemic in Australia and is spread by bats. Since the first documented outbreak in horses in 1994, Hendra has killed 102 of the animals. It kills people, too: On seven occasions, it has crossed from sick horses to the veterinarians and other professionals attending them, leading to four excruciating deaths. For the last six years, the animal-pharmaceutical company Zoetis—previously a Pfizer subsidiary—has sold a vaccine called Equivac to prevent horses from contracting the virus. In early May, the dogwood trees in the Clinch Valley of far southwestern Virginia are in full bloom, looking like puffballs of white confetti bursting amid the tree canopy. Situated on the western side of the Appalachian Mountains, the Clinch is a special place, home to more than 100 species of trees with evocative names like sourwood, bitternut hickory and shagbark hickory that were coined back in the pioneer days when the place was Daniel Boone’s stomping grounds. Greg Meade, a Nature Conservancy forester, is driving his pickup from the valley’s bottomland cattle pasture up into the steep hillside woodlands. “The complexity of our forests is unmatched in the lower 48,” Meade says. He can start his day in a yellow pine forest and be tromping through a fern-filled, moss-covered spruce rainforest by lunchtime. Meade’s job isn’t so much about deciding which trees to cut but which ones to leave standing. Big ones, mostly. He is promoting a reversal of the way that privately owned forests in Appalachia have been managed for the past century. Landowners once saw their forests as emergency piggy banks that they could tap into in times of need, bringing in loggers to chop down the most valuable hardwoods, such as black cherry and oaks, with no thought given to which trees would repopulate. This shortsighted approach led these forests to lose the diversity that sustains their economic and ecological value. Having forests with trees of different ages helps facilitate regrowth, while maintaining a mix of species can protect these forests from diseases. The Clinch Valley Conservation Forestry Program launched in 2002 and now protects 22,000 acres, thanks largely to California’s new carbon market. The Clinch Valley program established partnerships between TNC and private landowners to better manage these working forests and ensure they remain intact rather than being developed. With the last free-flowing tributaries to the Tennessee River, the Clinch Valley boasts the nation’s highest concentrations of endangered fish and freshwater mussels, which depend on the clean water that healthy forests provide by reducing erosion. As it happened, at the same time on the other side of the country, California’s government was confronting the state’s substantial role in contributing to climate change. If California were a separate country, it would have ranked as the world’s 12th-largest emitter of greenhouse gases, falling between Spain and Poland. In 2006, implementing new state law, California created a cap-and-trade system designed to first freeze and then reduce the greenhouse gas emissions of power producers, transportation and manufacturers in the state. That system has had profound effects on climate emissions and conservation in California. “When I started working on this,” says Louis Blumberg, the head of TNC’s California climate program, “California was the eighth-largest economy in the world and the 12th-largest emitter of greenhouse gases. Today California is the sixth-largest economy and the 19th-largest emitter.” And California’s program is also having a dramatic impact throughout the U.S. and Canada. The cap-and-trade program opened up a new chapter in Virginia’s Clinch Valley. The forests that Meade manages act as a sponge for carbon dioxide. With each growing season, the trees lock away climate-warming gas in their swelling trunks. Under California’s cap-and-trade program, California polluters could offset a portion of their emissions by paying forestry projects like Meade’s to keep their forests intact. “California recognizes that nature is a powerful tool to address climate change,” says Blumberg. “Their cap-and-trade program is catalyzing forest conservation programs across the United States.” California’s successful comprehensive program makes it one of the leading government entities to tackle climate change in a serious way. The program is supporting scores of forest conservation projects from Virginia to Alaska, including several led by TNC. It is also demonstrating that, even as President Donald Trump withdraws the United States from the Paris Climate Accord, American states, cities and businesses can not only take action on climate change on their own, they can do so in ways that generate economic benefits and grow economies. The name rang a bell with Liz. She had a vague recollection of seeing a 1979 made-for-TV movie called Son-Rise: A Miracle of Love. In the movie, New York advertising executive Barry Neil Kaufman and his wife “cure” their son’s autism at home, spending more than eight hours a day immersed in his world and copying his behaviors. The therapy seemed worth a shot. So in August 2005, Liz and her husband paid $1,623 in fees, left Sam, then almost 4, with a family friend, and drove to the institute’s 100-acre campus for a five-day Son-Rise “startup” class. The angular brown buildings scattered in the woods give the institute the look of a New Age monastery. Adding to the monastic vibe, participants are advised to leave their valuables at home because the dormitory doors lock only from the inside. Over the next four years, she spent nearly $50,000 on Option Institute programs, both for Sam and for her husband and herself, and to train as a mentor for other parents. Although that amount may seem extreme, she is hardly alone: More than 30,000 families from more than 120 countries have participated in the Son-Rise Program over the past three decades, according to the institute. Some families pay full price to attend multiple courses, others receive scholarships from the institute, and a few even resort to crowdfunding. “Your generosity would allow our beloved son to experience the best treatment available,” reads one plea to raise $25,000 on the GoFundMe website. At the same time, autism researchers express frustration that the Kaufmans discourage parents from combining Son-Rise with proven behavioral therapies and direct them instead toward alternative treatments, such as horse therapy and homeopathy. Some former employees Spectrum interviewed describe the institute as rule-bound, lacking in transparency, and focused on fundraising. The Kaufmans, they say, control nearly every detail of the program and demand unstinting loyalty from staff and commitment from families.